Have a picky eater in the house? Then give these 10 dinner recipes a try! No promises, but there’s a lot to be said about serving lots of variety and flavor! How can you call me picky when I’m eating a raw green bean Mom?! As I’ve mentioned in other posts about feeding my toddlers, I follow Ellyn Satter’s Division of Responsibility when it comes to mealtimes. I provide the food and mealtime structure [basically the when, what, and where], and my toddlers decide what and how much they will eat. Does that mean some days we pretty much snack all day long or eat things like dinosaur nuggets, mac n’ cheese, Bagel Bites, etc.? Of course. Not every day is a home-cooked meal or a meal at the family table. But for the most part, I would say 4 out of 7 nights I week I try to stick to my feeding rules and only serve one dinner for the whole family. I just make sure the meal somehow works for the kids too! And by works, that means I always have 1 food [nutrient-rich] I know they will eat on their plate or table. And if they’re lucky, they’ll find more than 1 food or recipe they like. I also try to not serve the same thing two days in a row for dinner… which is HARD because I love leftovers. But the rest of my family doesn’t share the same sentiment. I guess you could say those are my BIG TWO rules for feeding picky eaters. There are definitely more tricks of the picky eating trade I’ve found worked [you can read more about those here and here]. But for the most part, these two work more often than not. I’ll tell you who is ready for dinner. NOW. Ms. Lily. Sis has an appetite like Mom, and likes trying new things [so far so good, fingers crossed]. OK so on to the good stuff. 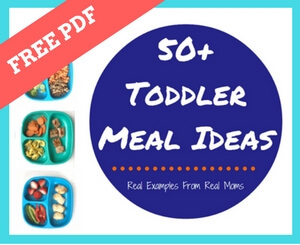 Aka, the dinner recipes I think your picky eater might like! I can’t make any promises, but these are a few of my boys’ favorites that they seem to sit down and eat [for about 8 minutes at the table— which is a lifetime in toddler-world!]. Hot Dog Pineapple Kabobs [deconstructed]: Who doesn’t love a good old fashioned hot dog?! Chicken Parmesan Melts: Mom’s version is a little low-carb. Slow Cooker French Dip Sandwiches: Can you tell my guys like cheesy bread?! A simple store-bought rotisserie chicken: With a few favorite, easy sides! No recipe here guys…. just juicy, flavorful chicken. Simple, slow cooker shredded chicken mixed with marinara sauce: The new side was riced broccoli! Which ended up on the floor, and in their mouthes. Slow Cooker Balsamic Chicken: A new favorite! Greek Chicken Hummus Bowls: Always deconstructed for the toddler crew! Another no-recipe meal: Tomato soup [with Goldfish croutons- so fancy] + Grilled cheese! Back to hot dogs! Or your families favorite sausage: Mom healthifies her’s with some delicious veg on top. The boys get their veg on the side. Whatever works! and lastly, 40 Cloves of Garlic Chicken: Make sure they brush their teeth after dinner! What I can personally say about feeding my toddlers is that their food preferences seem to change like their preference for a certain game or toy. They like it for 5 minutes and are on to the next best thing. Will they go back to that original toy? You bet! In a day or two. Or maybe a week! Dinner seems to be the biggest struggle in my house, but knock-on-wood, I’ve found a few standby’s I think even the pickiest of eaters will like. And if not? Don’t sweat it. I swear after Lily was born the boys survived off of dinosaur nuggets and grilled cheese for a month. Now they are back to liking things like grilled chicken and tortellini soup. So there you have it guys! Nothing fancy. But certainly delicious! And the majority are Serbinski-toddler-and-baby-approved! Thanks for thé link to Ellyn Satter’s web site, it was exactly what I needed this morning! She’s the best! And I reference it often! Could you recommend a decent hotdog? I like the taste of most of them, but am freaked out by the ingredients of some. Thank you! I really like Kroger’s Simple Truth hot dogs or Applegate!